Dahlia oversees the information systems department of a mid-sized IT consulting firm. She has been on the job for 15 years, earning many commendations and merit increases which reflect her work ethic and competence. Three years ago a new level of management was created as a go-between straddling Dahlia’s shop and the Managing Director. Ramon, her new supervisor, is very composed and seems to know a lot about the business overall. However, his supervisory style is completely different from what Dahlia is used to. She now finds herself in an endless stream of one-on-one supervisory hour-long supervisory sessions with Ramon during which she is interrogated about every aspect of her job, real and potential problems and given possible solutions. The reporting requirements for her position have also more than doubled thanks to the new job description Ramon created for her position. The emotional strain for Dahlia from being so closely scrutinized has her seriously considering leaving, or, at the least, transferring out of that department. Three years ago I was hired to coach Brad, the new Branch manager of a retail chain and the chain’s board chair, Cecilia. I was told that Brad was a problem worker who had trouble adhering to the organization’s chain of command. Brad felt smothered by Cecilia and Cecilia felt that Brad was openly insubordinate. This had to work or else Brad would be fired. After several interviews and coaching sessions with both parties I was stunned to realize that there was almost no authority given to Brad to perform the most basic duties without first clearing it with his boss. This ranged from Brad’s meeting with local buyers to get the best price, to approving staff’s time and leave. I put bullet points from Brad’s job up on a board and there wasn’t one task that could not be overseen by Cecilia. Brad felt that his management title was meaningless. What is Micro-managing and why do people do it? Micro-management refers to an extreme version of supervision which involves oversight that exceeds normal expectations or requirements. While a manager is charged with seeing that work is accomplished through their staff, Micro-managers use their staff as hand puppets, directing their every move, reviewing their every decision, and sometimes even doing their work. 1- This is how they, themselves were supervised so they think that’s what the job requires. 2- They are naturally over-controlling and this is their comfort zone. They cannot allow for variation in how work is done or the possibility of error. This unnerves them. What does micro-management look like in one’s management style? There are many reasons for poor delegation, but chief among them are the beliefs that “I can do it faster than I can explain it” and “They’ll do it wrong”. You create a decision-making system that is paralyzed by your perpetual “analysis paralysis”. There is no space for staff to creatively solve problems or make decisions on their own. Your team refuses to show innovations because they know you will “punish them” for not doing things “the way it has always been done”. You fail to give them to freedom to fail so they overly depend on you. You find yourself re-doing a lot of work the subordinates do because it’s not up to standard. At the same time, you do not show people how to bring their work up to the level you desire because “they might mess it up”. You’re not doing your own job because you are so preoccupied with your subordinates’. If pushed, you admit you do not trust your team to do things right. First, if you are new to your role and you previously did the tasks your team is doing, you must mentally transition out of the doer role. You have to step back and see the bigger picture – how every person’s part fits into the whole. You serve both your staff and the mission of the organization by providing what guidance and resources the staff needs in order to do their job optimally. If you continue to do the job, you may as well continue in your lower title. Now what? OK so I busted you. How does one move into a more reasonable system of management that still holds staff accountable for producing excellent work? If you are truly concerned about the competency of one or more subordinates, it is your responsibility to help develop them. Everyone is a novice at something at some point in their career. An experienced child welfare investigator may be a novice at the new computer tracking system. A new hire may be a novice at the codes you use when enrolling new clients. You may have been an awesome programmer but you’re a novice supervisor. You have to believe that people can grow or you’re in the wrong job title. Developing staff includes: Demonstrating a task, then having them help you accomplish it, then you helping them accomplish it, and finally letting them do it on their own. Feedback must happen at every stage, not just you telling them how you feel they did, but their asking you questions about why and how things are done the way they are. Job shadowing workers more experienced in a certain area that may be unfamiliar to others is another very effective way to bring up a person’s performance in a weak area. An entire unit can be trained in-house on new procedures or policies. Then, there are formal training classes and even conferences that help employees come up to speed and then shine in the new responsibility. Staff development is ongoing. Delegate both responsibility and authority. If I have the responsibility to see that new inventory is logged in, I also need the authority to be able to troubleshoot and solve problems on my feet when something goes wrong. If a recreation director at a Senior Center is charged with making the monthly recreation schedule, she must also be authorized to acquire the materials or personnel needed to carry the program out. Without authority, after every task is completed it will be put into the manager’s lap, awaiting approval and wasting valuable time. It slows down processes unnecessarily. The Decision or Delegation Tree was developed by Susan Scott, author of Fierce Leadership. Leaf decisions can be made by the staff person with no reporting requirement. Branch decisions can also be made by the staff, but they must tell the supervisor of the decision once it is made. Trunk decisions can be made by the staff person or with the manager, but the decision must be approved by the manager before it is actually carried out. Root decisions require the participation of many of the vested parties. The staff person may or may not be asked for input at this level at all. 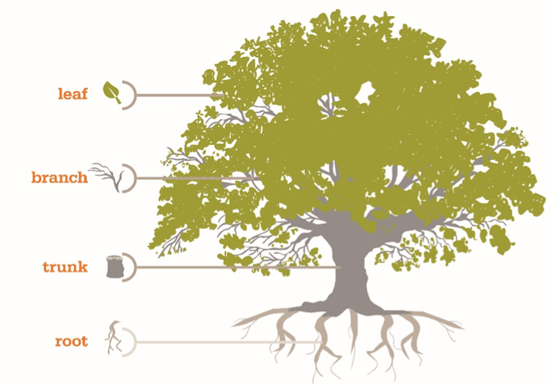 Within one job description there will be roles that are categorized into each of the parts of the tree. Some decisions will remain root decisions (like changing an agency’s mission) that will always remain root decisions. Others may go further up the tree, granting the worker more and more autonomy in decision-making as they gain experience and expertise. Components of one task may even be split into different kinds of decisions. A good way to test if you’re over (or under-) managing is to draw a big tree diagram on a large white board and write all of the parts of a person’s job or decisions on separate sticky notes. Then stick the notes on the tree next to where they correspond according to the chart. If you have too many decisions clumped at the bottom or near bottom of the tree, you’re not giving enough autonomy. If that’s the case, ask yourself why. Managers get work done through people. The people, however, must be empowered through training and delegation to “move up the tree” in more and more areas. You will be the better for it!